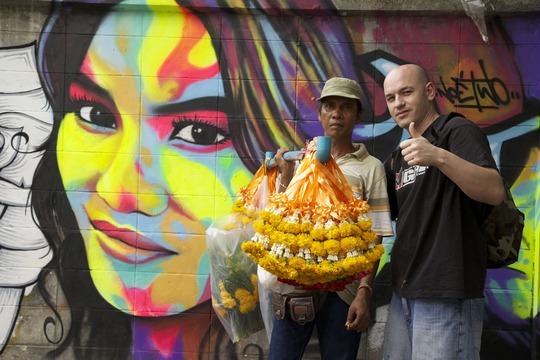 Support the movie " Graffiti trip in Thailand "
Follow an adventure filled with colours. 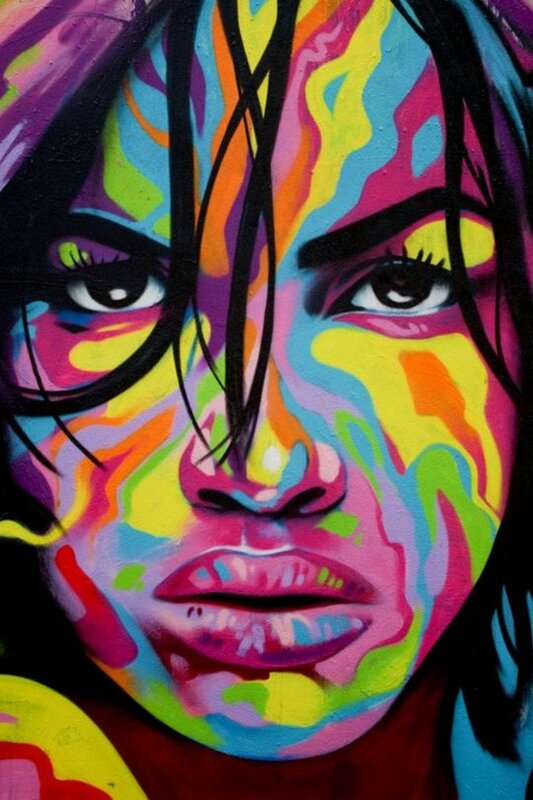 Participate in the plan of film of Noé Two, artist acknowledged in the world of the Graffiti, in creativity without border!!! To accomplish the dream, Noé Two decided to solicit you to produce this first film on KissKissBankBank. 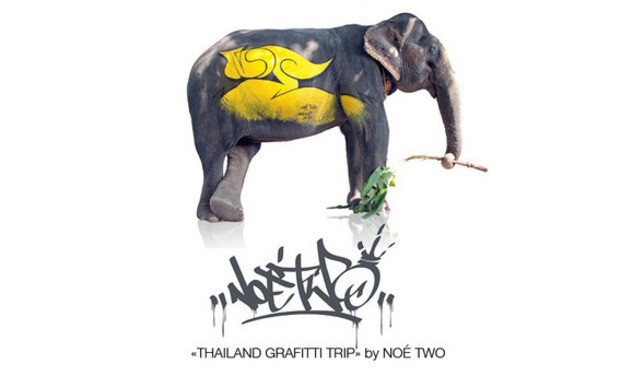 Noé Two and Yann Rineau like to make you discover the Thailand by prism of the urban art. This film allows us to appreciate artistic, cultural and popular treasures of this country, a way to see the coloured world and to travel in another way. Share with him all stages of this adventure, the preparation of the film, receive the film exclusively a week before its exit, put your name on the generic and use presents that Noé Two chose for you! 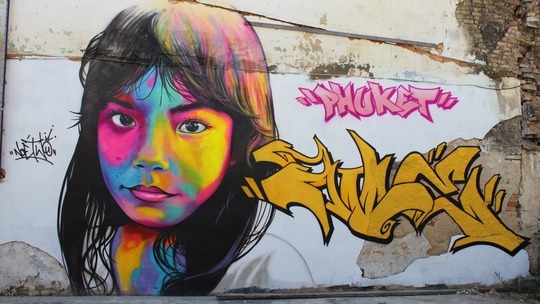 Like a book of trip, the artist Noé Two takes us in the urban Thailand. Across this advenbture Noé Two likes to confront his art, his origins in other codes, in other traditions, in other cultures. 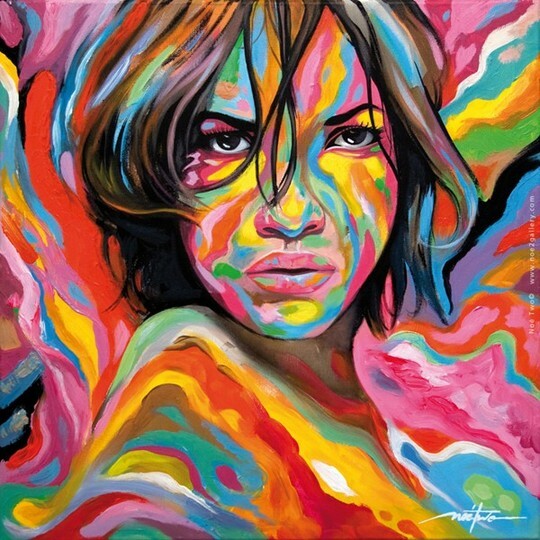 Painting is for him a means to meet people, manner of working new looks, new traits. He explains us why this destination, what he comes to search here, what brings him this exchange. 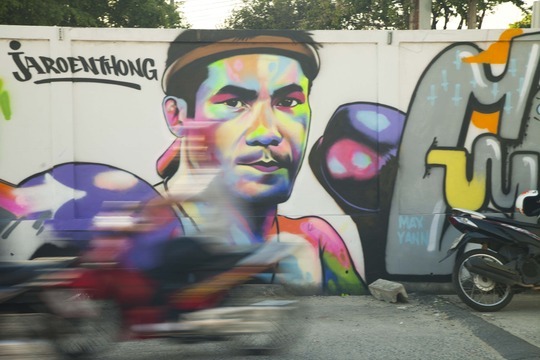 Day after day, we discover the birth of one of its writings, meeting in the photograph, the draft on its book, in projection on a wall of Bangkok, Phuket, a temple Boudhiste. The objective of this film also is to understand what takes place in front of the wall, how everything gets organized, how the choices of colours, style, size put on in place., The shock of urban cultures brings him other desires, but especially bring an important source of inspiration for this street artist. . The film puts forward its meetings, its job and puts down a look the reception which is made welcome for him. The film is also opportunity to discover Bangkok, Phuket, Chang Mai, the city, the campaign, his inhabitants, its rivers in the daytime and at night. I like to follow Noé Two in the trip, to understand what enlivens it and especially try to live its passion with him. It is opportunity for me to go to film an artist in full action. The film is shot in camera back up to crunch the figures, a picture in movement, a picture very coloured to reinforce the beauty of the filmed portraits. The film shows the ambience of the street, the city, the country. So many places and ambiences which I like to underline and to emphasize. The filming of sequences is made with a light team to favour participation with the figures and favour reactions and natural attitudes. 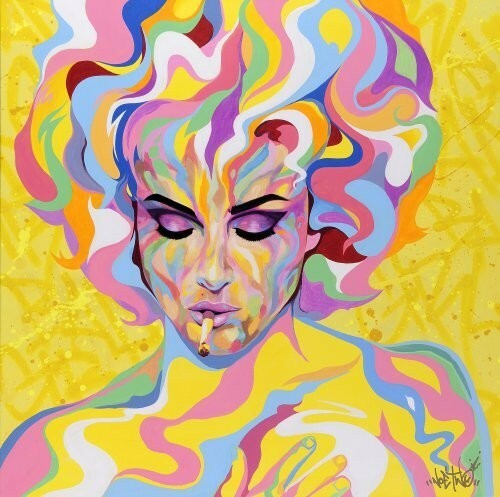 This teaser accomplished by Yann Rineau offer us to follow the artist Noé Two in a called video "Graffitis Trip in Thailand", in the middle of bright trip. This film of 5 ’ was realisé with Posca and LGB prod to spot and prepare this documentary on the nonstandard adventure of Noé Two for the country of smile. This film allows you to understand that we want to accomplish and to appreciate the job of Noé Two. These pictures will serve on the start of the documentary. Now we like to accomplish the second and the third part, to invest absolutely the temple Boudhiste of Bangkok, then in an another time Thai nature in Chang Mai. Noé Two likes to pass fourteen days in eight rounding off in the temple to do again free everything and live to the rhythm of the Monks, one truth immersion in Thai tradition. Hollowing-out as l 'éléphant Noé reserves you full of surprise!!! 8000€ sum that we decided to show in this gauge represents the minimum of contribution to the financing of the film so that this plan has sense. More than ever, we encourage you therefore to continue making live plan, even once attained gauge! Follow the project on Facebook ! 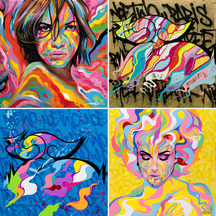 For those who do not know Noé Two, here is some examples of his job !!! Inscription au générique du film ( illimité ) Vous serez inscrit au générique de fin du film, avec les autres contributeurs de Kisskissbankbank. Inscription au générique du film + DVD ( illimité ). Vous serez inscrit au générique de fin du film, avec les autres contributeurs de Kisskissbankbank. De plus, vous recevrez un DVD. T-shirt limité + DVD T-shirt limité + DVD ( 100 max). Vous recevrez un T-Shirt avec le flop de Noé Two Vous serez inscrit au générique de fin du film, avec les autres contributeurs de Kisskissbankbank. De plus, vous recevrez un DVD. 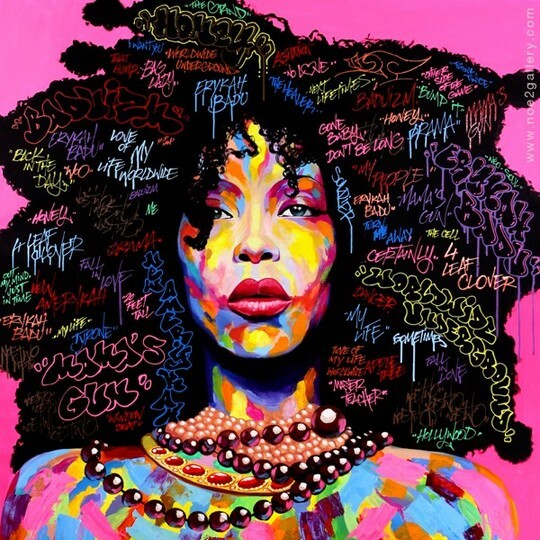 1 reprographie "Giclée" + DVD (5 max). Vous recevrez une reprographie de Noé Two. Vous serez inscrit au générique de fin du film, avec les autres contributeurs de Kisskissbankbank. De plus, vous recevrez un DVD. reprographie "Giclée" + DVD ( 3 max ) Vous recevrez trois reprographie de Noé Two. Vous serez inscrit au générique de fin du film, avec les autres contributeurs de Kisskissbankbank. De plus, vous recevrez un DVD.